Late Saturday afternoon in the small and very popular village Collioure not far from the border to Spain. The gem of the Catalonian coast, Collioure is encased in a small rock bay, with the Alberes Mountains practically pushing her into the sea. 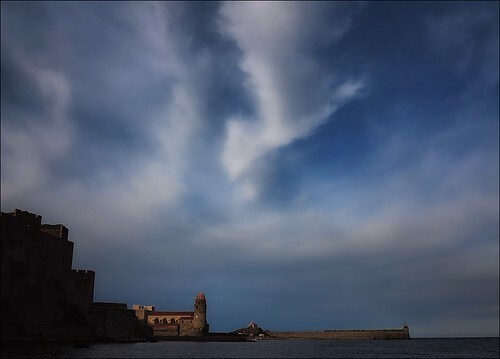 Collioure has managed to escape any of the real estate development that has devoured the coast of Roussillon down to Argeles-sur-Mer, six miles away. The town has kept much of its unique medieval character. The Royal Castle separates the bay and is surrounded on one side with cafes, shops and art galleries. Caught between the bay and the sea stands the church, adjacent to the ancient lighthouse that now serves as a bell tower. The rose dome atop the tower is the trademark of romantic Collioure.